With TOTY coming to a close, our focus turns back to other promotions, and next in line is TOTW 18. We have another week with limited matches from across the world, which leaves us with a very difficult selection to make, with some players making the cut from just turning up on the day. As usual we kick start these predictions with a goalkeeper, and according the rest of the FIFA community, he is the best in the world. Manchester United were away to Tottenham for the late kick off on Sunday, and in a game that provided just the one goal, there was only one hero on the pitch. Tottenham had a total of 21 shots against this man’s goal, and De Gea made a total of 11 incredible saves. With his TOTY leaving packs today, could we be seeing yet another special card entering packs on Wednesday? Benfica were comfortable 2-0 winners away to Santa Clara on the weekend, allowing them to maintain some sort of pressure on league leaders Porto. Jardel was an absolute rock at the back, but also showed his capability going forward. With a goal and the clean sheet to his name, there is every chance he makes the lineup this week. Across to Spain now, and with the lack of games to choose from, this is where things start to get a little more unpredictable. Atletico picked up a narrow 1-0 win over Levante on the weekend, with the only goal coming from Griezmann in the form of a penalty. Unlike our other defensive nominations, Juanfran may not have managed to work his way onto the score sheet, but he did put up a solid defensive performance, help keep the clean sheet and manage to obtain the highest overall match rating this week. PSG picked up a comfortable 3-0 win away to Amiens this week, and despite Marquinhos being the man who made our lineup, this spot could go to almost anybody from the starting eleven. Draxler took the highest rating along with an assist, Mbappe scored once, while Cavani scored from the spot and provided an assist. Marquinhos however, ensured the clean sheet and found himself on the scoresheet. This one could really go in almost any direction though! With the match tied at 1-1 approaching the 75th minute, it looked like Real Madrid would once again be dropping points in the league. Real Betis had put up one hell of a fight, and if it wasn’t for the supersub Ceballos, they would have likely stolen a point. Ceballos was on the pitch for just 15 minutes; but it was his incredible strike that separated the two sides and gave Madrid a much needed win on the night. We did warn you that this week left us extremely short of viable options, and our next selection only reinforces our point. Watford picked up the win with a 2-1 away victory against Crystal Palace on the weekend, and our nomination player less than 30 minutes of the match. After an early own goal from Cathcart, he made up for his mistake in the 67th minute by equalising the match. This was then followed immediately by the introduction of Cleverley, who went on to score the winner just six minutes later, talk about an impact sub! Lille were on the road this weekend as they traveled to Caen for their Ligue 1 fixture. The journey proved to be worthwhile, as the visitors left with all 3 points during a fairly comfortable 3-1 victory. Pepe was in sublime form on the night, scoring once and assisting the other two, giving himself a real shot at yet another upgrade this year. With the lack of matches taking place again this week, some of these selections end up being closer to a gamble than that of logic. Chelsea were 2-1 winners over the travelling Newcastle on Saturday, with goals from both wingers and an assist from David Luiz was again. Pedro was the man who scored the highest rating, and without an inform to his name so far this year, Pedro is also the man who sneaks his way into our predictions this week. We move onto a slightly riskier nomination now, and it’s not because he isn’t deserving, it's just because he received his last inform very recently. Al Shabab picked up the points with a 4-1 win over Al Fayha this week, and once again Budescu just couldn’t keep himself away from the scoresheet. With a fantastic 90 minutes and two goals to his name, it becomes difficult to ignore this man’s performance, however will EA decide it is simply too soon to upgrade him once again. Back across to Spain now, where Athletic Bilbao take all three points with a 2-0 home victory against Sevilla. Bilbao managed just 3 shots on target across the 90 minutes, but Inaki made sure that his shots really counted. 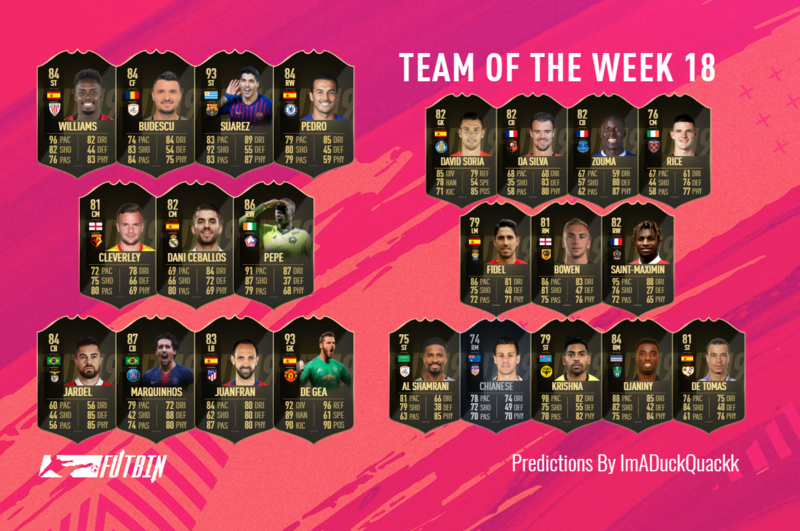 With 2 goals, a near perfect match rating and the man of the match award, Inaki fires his way into our predictions, with a card that will cause endless nightmares during the Weekend League. We remain in Spain for our final selection here, as we head across to league leaders Barcelona and their home fixture against Eibar this week. The match ended with a very comfortable 3-0 win for the hosts, and despite solid performances from across the team, Suarez was on another level. Playing a part in all three goals, Suarez found the back of the net twice and also assisted the third, while securing a perfect match rating in the process. Onto the bench now, and first up we have an incredibly difficult goalkeeping decision to make. Besides De Gea, there weren't any incredible performances this week, leaving this second spot an incredibly tough one to fill. Our selection sees us targeting the Villarreal and Getafe match, where Getafe picked up the points with a 2-1 away win. Despite the lack of a clean sheet, Soria was fairly solid, dealing with a total of 17 shots and making 6 great saves across the match. Over to France again now, where Rennes were narrow 1-0 winners away to Nantes on Sunday. Despite having less possession, a lot less shots and overall being on the backfoot from the start, they kept their confidence and created an unbeatable defensive line across the 90 minutes. Da Silva was at the heart of this, hardly put a foot wrong across the match, and also scored the match winner. Give this man his upgrade! Over to England next, where two struggling sides, Everton and Bournemouth, went head to head. On the day Bournemouth were the better side, but they just couldn’t seem to convert their possession or chances into goals. Everton however made the most out of the few opportunities they created, winning the match 2-0 and taking the points. Zouma was a rock defensively, and when we then add his goal into the mix, there is simply no other possible nomination. After a fairly slow start to the season, West Ham seemed to have turned a corner, putting together a much stronger set of results over the past 6 weeks. This form was shown once again on the weekend, as they payed hosts to the travelling Arsenal for this London Derby. The match itself was fairly close, but it always felt as if West Ham were on top. Rice was phenomenal throughout, and the fact that his goal is what separated the two clubs gives him every chance at an upgrade on Wednesday. Las Palmas were hosts to Osasuna for their fixture this week, in a game that provided fans with a total of 5 goals. It was all one way traffic on the day though, and while the visitors may have managed to steal a goal, the game ended with a comfortable 4-1 home win. Fidel was in great form on the day, and while he may have only played for just over an hour, it was still more than enough time for him to find himself a couple of goals. Down to the second tier in English football now, where once again we face another controversial selection. Hull took all the points with a 3-0 win over Sheffield Wednesday on Saturday, and Bowen was the man behind two of these goals. Now with such limited competition, 2 goals has been more than enough to see somebody cruise into the lineup, however with his last inform so fresh in EA’s mind, is it too soon to see him make make the team once again? I really, really don’t love this selection, but with the amount of Ligue 1 players feeling fairly low, we needed another inclusion. Nice we’re 1-0 winners over Bordeaux on the weekend, with the only goal of the game coming from the spot. Maximin was solid across the match, but in any other week a single penalty is very unlikely to be enough, this week however it may just earn him a spot. Al Shabab were comfortable 4-1 winners over Al Fayha this week, and with such a result, numerous TOTW candidates suddenly appear. Al Shamrani is the man who gets our vote though, with a solid performance throughout, a goal and an assist to his name too. Back across to La Liga now, where Rayo Vallecano played hosts to the travelling Celta Vigo. The match provided spectators with a total of 6 goals, four of which went in favour of the hosts. Tomas was in simply spectacular form, scoring not once, not twice, but three times to secure his hat-trick along with all 3 points for Rayo Vallecano. Sometimes a player creeps into the predictions with a solid performance. Sometimes it takes a goal, while other weeks could even require 2. Sometimes a player will just go out and score 5, just to ensure they get their spot, which is exactly what Djaniny did this week. Al Ahli were 5-0 winners over Ohod club this week, and with all 5 goals under his belt, there is simply no chance of him missing out on a second inform on Wednesday. Wellington Phoenix took the points with a 3-2 victory over Central Coast Mariners on the weekend. Krishna played a part in each and every goal, scoring twice and assisting the third. When we then also consider that he scored twice during a 3-2 win this week, surely he is a lock for the team come Wednesday. Perth Glory were 3-1 winners at home to Sydney FC this week, and while there were fantastic performances across the squad, only one man could possibly take this spot. Chianese was in fantastic form, playing a part in every goal, scoring twice and assisting the third. The only concern here is the other strong performances from this league, but with the lack of matches taking place across the world this week, a couple of inclusions from here wouldn’t be a surprise.